This is the best season to bag galaxies, so I thought I would have a go at the 'Sombrero' in Virgo. (M104) I managed to tweak the mount to track slightly better. 11 x 45second exposures were stacked to give this image. I have viewed this galaxy previously as a 'fuzzy', but I've not tried to image it before. It is easily visible in a 4" telescope, and even in binoculars. What you tend to see then is the bright centre of the galaxy. It takes something a bit bigger to see anything of the disk. The main feature is that ring of dust which surrounds the galaxy. I could never detect it in my 8", but it is quite clear in the 11". 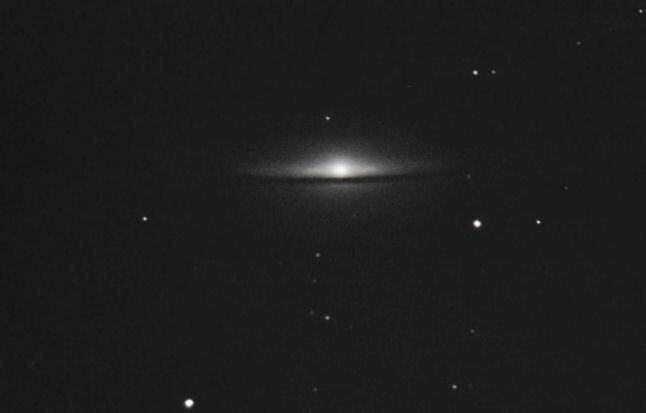 However, the ring images quite well even in a smaller telescopes with long exposures. It is one of those objects were you can't quite believe what you are seeing! what kind of telescope is this?